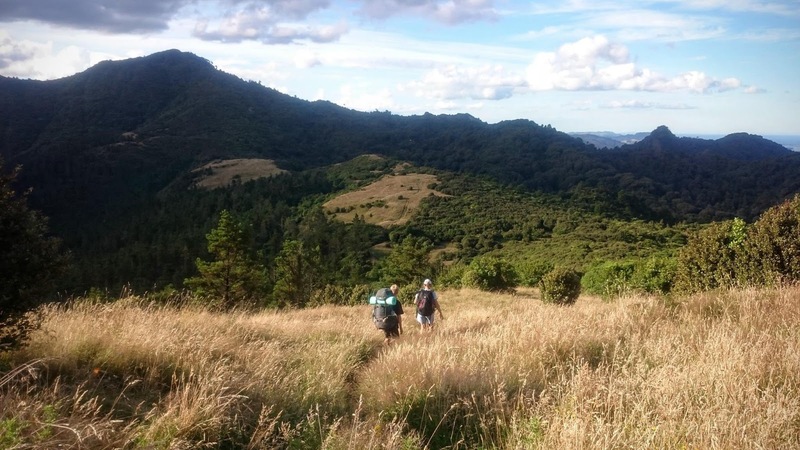 A light and fast tramping trip along the Kaimai Ranges. 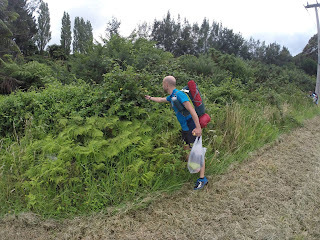 I saw this as an opportunity to safely experiment with how light weight I could go, and my pack was only 9.5kg including camping gear, food (2.2kg) and water. The mission began in style: alighting from the Intercity bus in the middle of nowhere on SH29. Masses of ripe blackberries spilling over the fence at the Lower Kaimai bus stop made for a delicious start to the trip. After plundering the bushes we hurriedly made last minute pack adjustments as the heavens suddenly unleashed a downpour. It was 3km back up the main highway accompanied by the din of tyres on wet tarseal, then another few kilometres up a side road through the Ngamuwahine Valley and onto the Leyland O'Brien Tramline to link up with the North-South Track. The rain stopped completely by the time we reached the road end an hour and a half later. Ngamuwahine and Leyland O'Brien tracks were easy going with sections of old logging tramways (complete with old wheels and machinery parts). Around 6pm we reached the Ngamuwahine shelter which had decent camping around it, but after a brief discussion we decided to push on to the junction with Te Tuhi track where I had heard there was a tent site. This would make the next day almost an hour shorter. Half way to the junction we caught up with a woman and her two grandchildren (6 & 8) who were a trifle lost. They had gone for a short walk at lunch time from the eastern side of the ranges and now were disorientated. 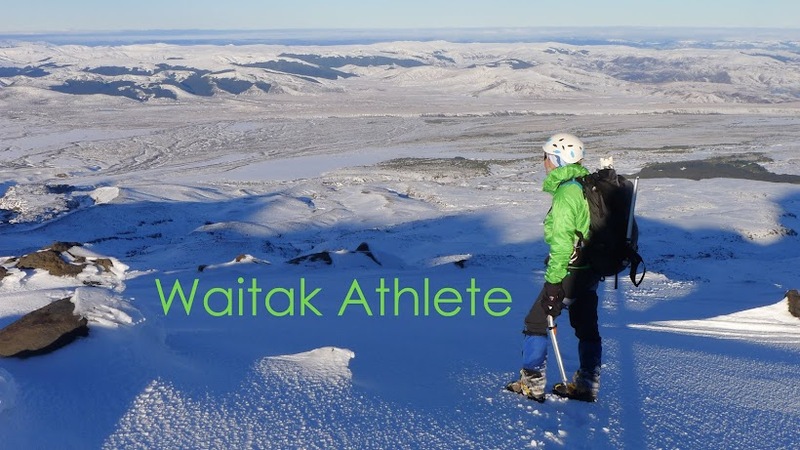 We walked with them to the junction from whence Dan and Reegan raced ahead down Te Tuhi track to find cell phone reception and call Search and Rescue while I stayed with the family. It was dark before we got out of the bush and even then it was still a couple of kilometres down through farmland to the end of the road. 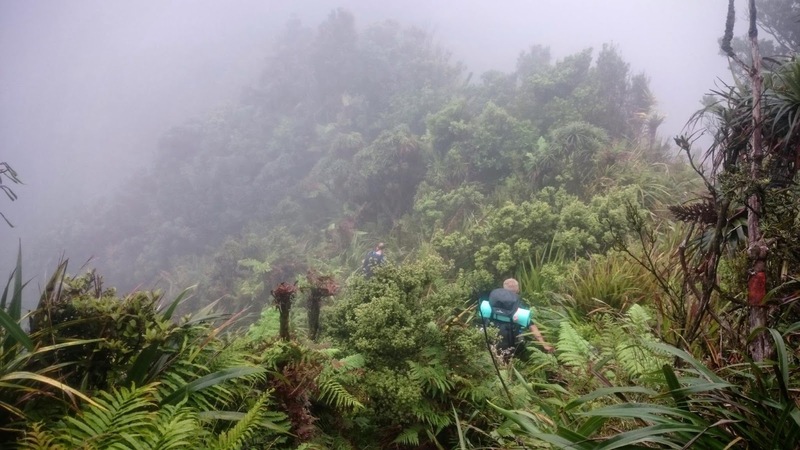 Police lights flashing at the bottom acted as a beacon - SAR had arranged for the cops to pick up the family and take them back to the Tauranga side. It was 9:30pm by the time we handed them over. 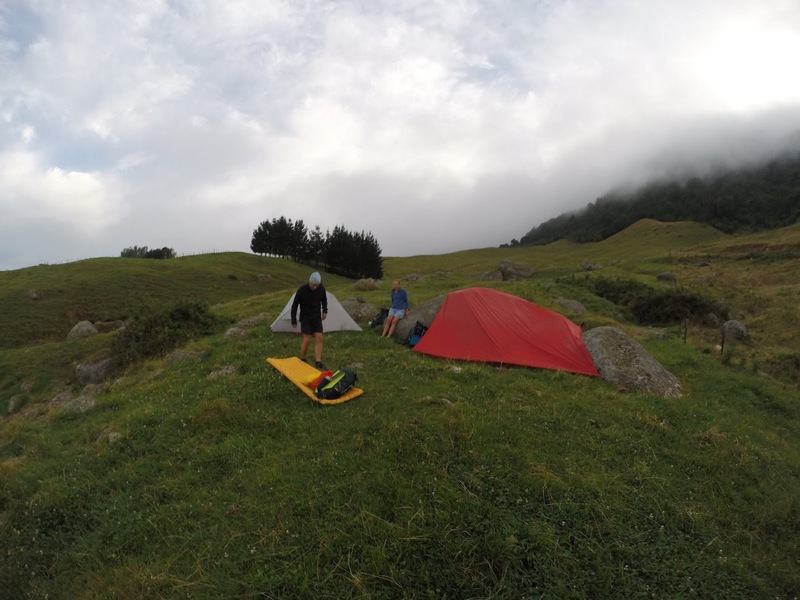 We headed back up the hill a short distance and found a lovely flat spot to pitch camp in the farmland. Probably not permitted as it is private property but we reasoned that the circumstances exonerated us. Dan and Reegan tented while I fly camped snugly in the shelter of a large boulder. The lights of Matamata shone close at hand and the stars twinkled above. Magic. It was 11pm before we finally tumbled into bed. A relaxed start in the morning, although the walk began with a steep 300m climb back up to the main North-South track which added a good hour to our planned route. A couple more hours brought us through to Wairere Falls. We dumped our packs and ran 10 minutes out to the lookout at the top of the falls. Past Wairere Falls the track became a little more overgrown with grasses. 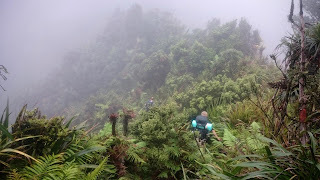 A few more kilometres along the top of the range before dropping steeply into the Aongatete River. We found a lovely pool for a dip and enjoyed the clear water. However there was still a long way to go so all too soon it was time to saddle up again. A couple of undulations up and over into smaller valleys then a stiff 300m climb back up onto the main ridge and the turnoff to Kauritatahi Hut. The track grew more rugged and less distinct as it climbed higher, although it was well marked with orange triangles. By the time we reached the junction all three of us were rather weary. The symptoms of tiredness varied between us: Reegan became slightly incoherent, Dan grew silent, while I was laughing at everything. The original plan had been to stay the night at Kauritatahi Hut, which is a 2km detour off the main North-South track with another 300m of climbing. In order to save any more backtracking we elected to push on to Motutapere Hut which was a bit further away but was on the main track. This would save a couple of hours the following day. So we pushed on north, rather footsore, eventually reaching Thompsons Track where a couple of dirt bikers were having a blast. More uphill then undulating through a large open grass area, remnant of an old farm. The track through here was a bit like a hedge maze as we wound our way through shrubbery. On re-entering the bush the track became quite rough and indistinct - it wouldn't have been easy to follow in the dark. A brief sit down at the Eliza mine turn off gave us the energy required for the final push to Motutapere Hut which sits at 580m. A tough 11.5 hours after striking camp we finally reached the hut and collapsed on the deck. First priority was to remove wet shoes to let shrivelled and mushy feet dry out! 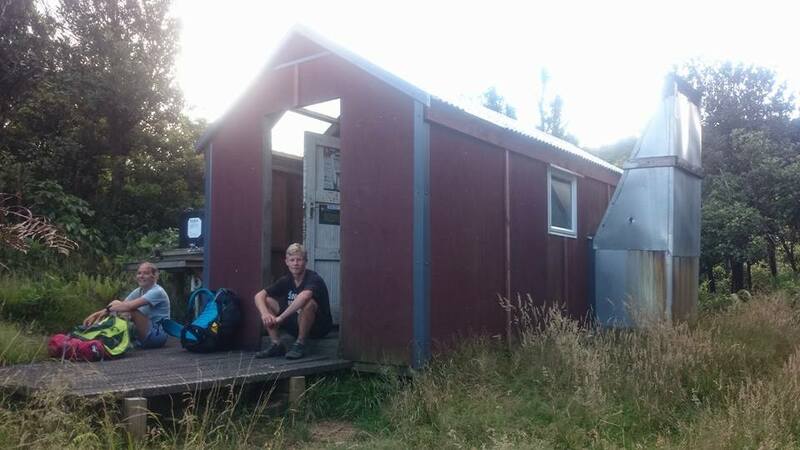 Motutapere Hut has recently been done up by the deerstalker association, and the 3 bunk hut has a good outlook towards Mt Maunganui. As darkness fell we were treated to a spectacular display of lightning over Tauranga with clouds lighting up every few seconds. We drifted off to sleep to the pitter patter of mice scurrying about in the roof. The next morning the hut was shrouded in cloud although the air was warm and still. Clambering along rocky outcrops we caught glimpses of the sun shining down on the western plains. An hour of undulating over many intriguing rocky knobs (from which I am sure there is a good view) brought us to the junction with Tuahu Track. Reegan managed to brush his hands through stinging nettle but luckily the reaction wasn't too severe. From the junction it was another hour through to Te Rereatukahia Hut. This track was even more overgrown with grass and because everything was wet the seeds stuck to my legs and shorts, needling me at every step. This hour was my least favourite of the whole trip. As we descended down to the Wharawhara valley on a benched track the cloud turned to rain, bucketing down by the time we reached the river. The next few kilometres followed alongside the river, crisscrossing several times near the top. 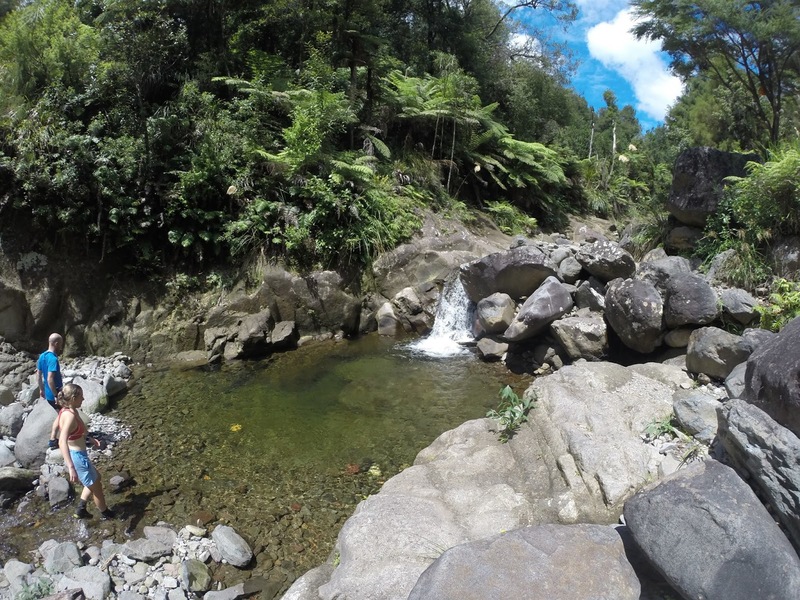 As the track leaves the stream it crosses a little side stream which forms a series of cascades and plunge pools. Reegan eyed up the narrow mossy chute and was soon careering down the best natural water slide I have ever seen. After a few backflips into the top pool it was time to attack the climb up to Cahsmore's Clearing. It gradually got muddier under foot but most of the bogs could be danced around. This section of track between the Wharawhara and Waitawheta valleys was the only muddy bit of the whole North-South track. A steep, rooty, slippery descent into the upper Waitawheta where the track follows an old logging route down to Waitawheta Hut. We passed an incredible large, deep round swimming hole at the base of a waterfall but opted not to take the plunge due to the inclement weather. On a sunny day it would be a lovely spot. The sun came out during our late lunch break at Waitawheta Hut. The next 6km along the old tramline beside the river was extremely hard on the feet as it was paved with unforgiving uneven rocks. We flew along in 1:20 hours as we were eager to finish this section. A final 1.5km push uphill to Daly's Clearing Hut and we were done. Finishing at 5pm was gentlemen's hours! We spent the evening eating, drying out gear, resting our feet and sitting on the deck chatting to the other two hut occupants. I slept soundly, and the drizzly morning was conducive to lazing in bed. However Dan was keen to push on to catch the 2pm bus out of Paeroa so we hit the road at 8am. 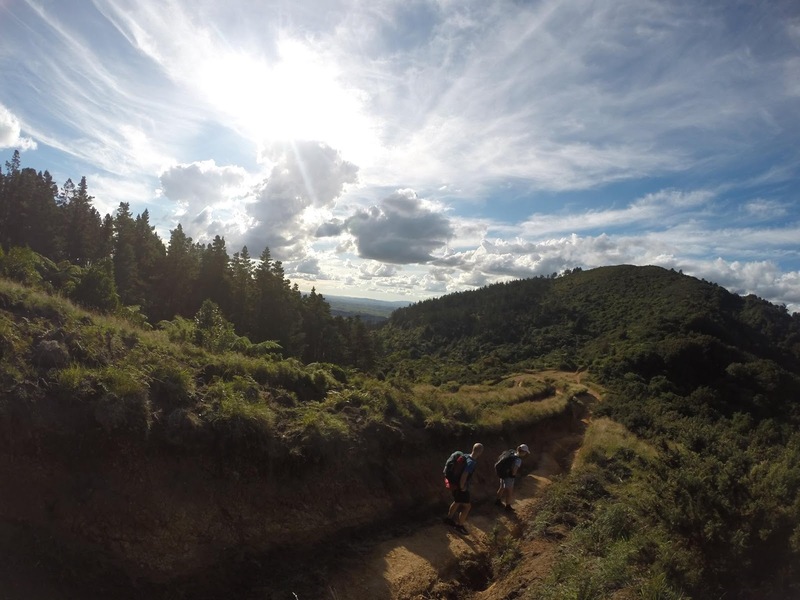 From Daly's Clearing to Karangahake is 13.5km of old pack tracks which make for easy going. There is only one steep descent before following the river down to SH2. There are several excellent swimming holes en route but the weather was not particularly conducive to taking a dip. All too soon civilisation was reached at Karangahake Gorge - tourists, cars, and noise. We joked that this was our turn around point and it was now time to head south back to Lower Kaimai. But I was only half joking. Given enough food I would have been much happier spending another 3 day tramping through the bush than heading into town. Dan and Reegan were just keen to hit McDonalds (and demolish a family box each)! Dan rang Intercity to change our tickets to the 2pm bus only to discover that it was full. Drat! Now we would have 6 hours to fill in at Paeroa. From Karangahake we followed the new Hauraki Rail Trail bike path. Now that the time pressure was off we dawdled the final 5km along the flat gravel path. 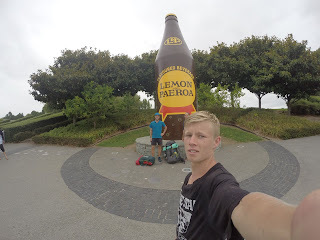 71 hours after hopping off the bus at Lower Kaimai we reached the L&P bottle in Paeroa. FINIS! It had been the hardest and fastest tramp I have done for a while and I thoroughly enjoyed it. One great thing about the North-South track is the variety. Every couple of hours the nature of the bush changed completely. 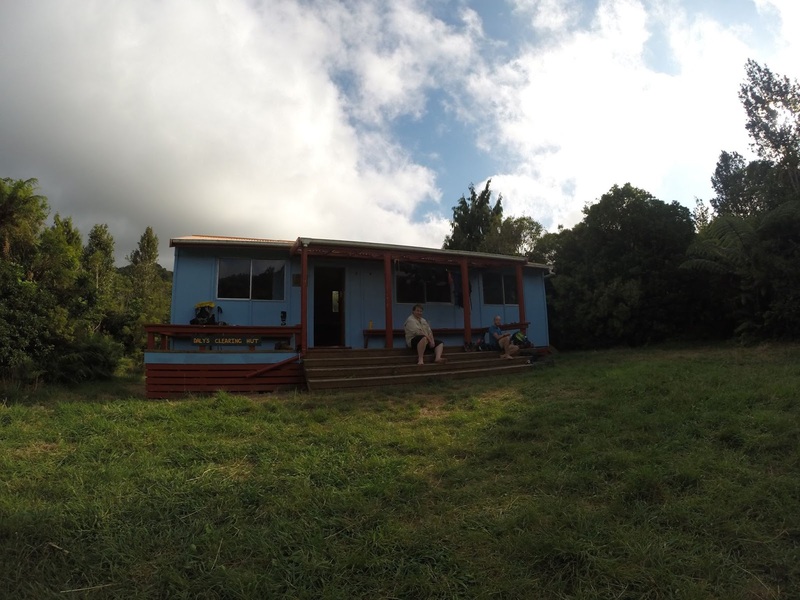 From lush rain forest to mamaku stands and nikau groves; scrubby bush to tall remnants of the old forest. There were flat trails, rocky ridge lines, rivers and everything in between. The Kaimai Ranges may not have the grandeur of the South Island but they are still very interesting. The one common factor along the trail was the grass. Loads of hook grass and knee high grasses with sharp seed heads which find their way into your boots, socks, shorts and everywhere else.